Looking for a Change from the "Typical" Hotel or Apartment Stay? How about taking a Walk on the "Wild Side"? IMPORTANT NOTE: At this time, the EMRO Suite is not available for rental. It has been reserved until further notice. When the Suite is once again made available for rental, notifications will be placed on the Home/Index page, as well as on this page. We apologize for any inconvenience. For your consideration, we have available a fully-furnished, one-bedroom flat above a cat shelter. Not just any cat shelter, but the internationally famous native Egyptian Mau cat shelter, EMRO, located in Cairo, Egypt! The EMRO Suite is currently available for weekly or monthly rental. Good for one or two guests. Mokattam is located 40 minutes from the International Cairo Airport (in Nasr City), and 25 minutes from downtown Cairo and Giza (the Pyramids). It is a quiet residential community that is fast becoming known as the place to be ("Uptown Cairo"). Located on "the mountain", or rise above the city (and smog line), where often breathtaking views of Cairo and the famous Giza Pyramids can be seen on the drive up or down. 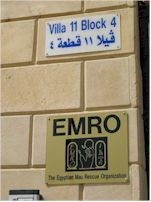 Top: EMRO building/villa, EMRO Suite is on the second floor; EMRO balcony and view; Stairway and front door entrance to the EMRO Suite. 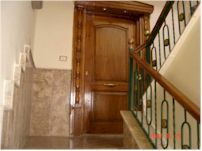 Top Middle: Hallway entrance to the Suite; Comfortable Living room; Elegant Dining room. Bottom Middle: Stocked kitchen area; Main bedroom with Queen bed and furniture (view 1); Main bedroom (view 2); Comfortable Living room; Elegant Dining room. Bottom: Large bathroom wth shower and laundry facilities; Small bathroom area; Address and EMRO sign. EMRO Headquarters and Shelter, veterinary clinic, as well as the EMRO Suite, are located in a residential area across from a future park and telecommunications central, and all are easy to find. Andrea's Restaurant, serving good quality Egyptian and continental fare is within easy walking distance, as is a café down the road. The Marriot Hotel’s "The Bakery" as well as the coffee shop, Beano’s, is also not far. A local grocery store, "Al Mahmal", and a local household store, "Tawheed & Nour", plus other local businesses that include fast food places are all within a 10-15 minute walking distance or short drive. Parking space for one car is reserved in front of the building for the tenant. Pick-up to and from the airport can be arranged (100 LE each way). A tour guide and/or general transportation can be arranged at separate cost at approximately $100 USD/day (tour site costs are extra). No smoking is allowed in the flat or in the building. Note: A two-story, fully furnished Villa may also be available to rent, and located above the EMRO Suite. For more information and availability, please contact info@emaurescue.org or pr-contact@emaurescue.org.